A new housing bill was signed into effect. Here is an excerpt explaining how it will affect people in trouble with their mortgages, from CNN. As with anything else, there is a price to be paid. Read the entire article. NEW YORK (CNNMoney.com) -- President Bush signed a $300 billion housing rescue bill Wednesday aimed at helping troubled homeowners avoid foreclosure and supporting mortgage giants Fannie Mae and Freddie Mac. After the law kicks in on Oct. 1, thousands of at-risk borrowers will be able to refinance their unaffordable old mortgages into new low-cost fixed-rate loans insured by the Federal Housing Administration (FHA). The Congressional Budget Office estimates that 400,000 borrowers with $68 billion in loans may benefit from the program - but the bill allows for as many as 1 million or 2 million borrowers to participate in the program. Here's what homeowners need to know. Qualified borrowers must live in their homes and have loans that were issued between January 2005 and June 2007. Additionally, they must be spending at least 31% of their gross monthly income on mortgage debt to be eligible for the program. They can be up to date on their existing mortgage or in default, but either way borrowers must prove that they will not be able to keep paying their existing mortgage - and attest that they are not deliberately defaulting just to obtain lower payments. Before homeowners can get FHA-backed mortgages, they must first retire any other debt on the home, such as a home equity loan or line of credit. Borrowers are not permitted to take out another home equity loan for at least five years, unless it's to pay for necessary upkeep on the home. To get a new home equity loan, borrowers will need approval from the FHA, and total debt cannot exceed 95% of the home's appraised value at the time. Borrowers can contact their current mortgage servicer or go directly to an FHA-approved lender for help. These lenders can be found on the Web site of the Department of Housing and Urban Development. How does the refinancing process work? This is a voluntary program, so lenders holding the original mortgage have to agree to rework a given loan before things can get started. The bill requires lenders to make major concessions, writing down the value of the loan to 90% of the home's current value. In areas where prices have plummeted by as much as 20%, that will mean a substantial loss for the lender. But lenders won't sign off on a workout unless they think that they'll lose less money on that than they would by allowing a home to go through the costly foreclosure process. Each loan will have to be underwritten by an FHA lender on a case-by-case basis. That means the banks will do a new appraisal to determine the home's current value, as well as examine and verify income statements, bank accounts, job histories and credit scores. Based on that new appraised home value, the FHA lender must determine how much the original lender has to reduce the original mortgage, so that it will reflect 90% of the home's market value. If the original lender agrees to the writedown, the new lender buys the old loan and takes over the reworked mortgage. As part of the deal, the old lender writes off any fees and penalties on the original mortgage, including prepayment penalties, and accepts the proceeds from the new loan on a paid-in-full basis. Additionally, it pays the FHA an up-front premium equal to 3% of the mortgage principal. There should be little up-front costs for borrowers to bear. Loan origination fees will vary by lender, but these can usually be paid by the borrower over the life of the loan in the form of a slightly higher interest rate. However, the refinanced loans do come with many strings. For one thing, borrowers are responsible for paying an insurance premium to the FHA guaranteeing the loan, which will be 1.5% of the principal annually. Borrowers also agree to share any profits from future home-price appreciation with the FHA. To do that, they'll pay a "3% exit fee" of the mortgage principal to the FHA when they resell or refinance. Plus, they'll agree to pay the FHA 100% of any profits they realize from higher home prices if they sell or refinance within a year. So if the original loan principal is $200,000 and the home sells for $250,000, the borrower will owe the FHA $50,000, minus costs. After a year, borrowers will share 90% of the profits with the FHA. The percentage keeps dropping in 10% increments to 50% after the fifth year, where it stays. Savings depend on what borrowers are paying for their present loan and where they live, but for most people it will be substantial, even after factoring in the FHA fees. In areas that have sustained huge price drops, such as Sacramento, Calif., where prices have fallen by about 30% over the past year, some loans might be reduced by more than 40%. Additionally, the FHA loans carry reasonable interest rates, which are fixed for the life of the loan, as opposed to a subprime adjustable-rate mortgage that can jump higher every six months. Looking for a large home for a large family? Or are you looking to rent out rooms to help with mortgage payments? Don't let this one slip by. Priced at a very low $115,000, you can click Here to see the virtual tour. 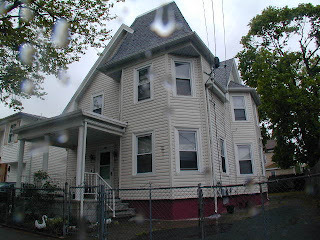 Four beds, full partially finished basement, vinyl sided, newer roof. This is a bank owned home and will be sold as is. The kitchen needs updating and home requires minor tlc. Hope you are celebrating this important day of Freedom in the United States of America!